ORCHARD PARK, N.Y. (AP) — Tre’Davious White had personal reasons for not sticking around to address questions from the media on Wednesday. The second-year cornerback, understandably, has plenty weighing on his mind. 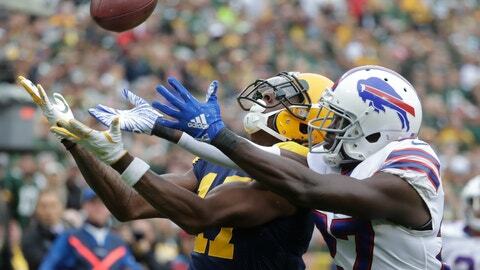 On Sunday, White faces the challenge of defending DeAndre Hopkins, the NFL’s leading receiver, in Buffalo’s game at Houston. Last week, he learned the unsettling news of his mother being arrested for domestic violence for allegedly stabbing a man, according to TMZ and several television affiliates in northern Louisiana. What’s not in doubt is White being ready Sunday. White hasn’t lost a step in following up an impressive rookie season . The first-round draft pick finished with four interceptions, two of which sealed victories, and was one of only two NFL players to force five takeaways (four interceptions and a forced fumble and recovery) in the fourth quarter. It was enough for him to finish second behind Saints cornerback Marshon Lattimore in Defensive Rookie of the Year voting. This season, White’s held his own in taking over the job defending an opponent’s top receiver on a full-time basis. He limited Chargers receiver Keenan Allen to six catches for 67 yards in Week 2, Minnesota’s Stefon Diggs to four catches for 17 yards in Week 3, and Green Bay’s Davante Adams to eight catches for 81 yards, though he didn’t cover Adams when he lined up in the slot. White is doing his part while the starting job opposite him remains unsettled due to injuries and after projected starter Vontae Davis left the team during halftime against the Chargers and then retired. “To be able to have a guy like him, who has the athletic ability and the mental toughness to match up and get us through some tough situations is a luxury,” defensive coordinator Leslie Frazier said. Bills coach Sean McDermott is impressed by how White, 23, has taken over the role of being team’s top shutdown cornerback. White was a four-year starter at LSU, where he earned All-America honors in his senior year. As a freshman, he developed his craft by going up against Tigers receivers Odell Beckham Jr., and Jarvis Landry in practice. In games, White’s first career interception was against current Dallas Cowboys starter Dak Prescott. Good as White might already be, he has far loftier goals. White has plenty more to do before he can be included in that conversation. White acknowledged he’s fueled by a fear of failure. It’s what motivated him as a teenager to become the first in his family to go to college and escape the tough neighborhoods of his hometown of Shreveport, Louisiana.